Do you enjoy the appearance of hardwood but not the maintenance that is required? Wood plank porcelain tiles are an excellent alternative to natural wood. 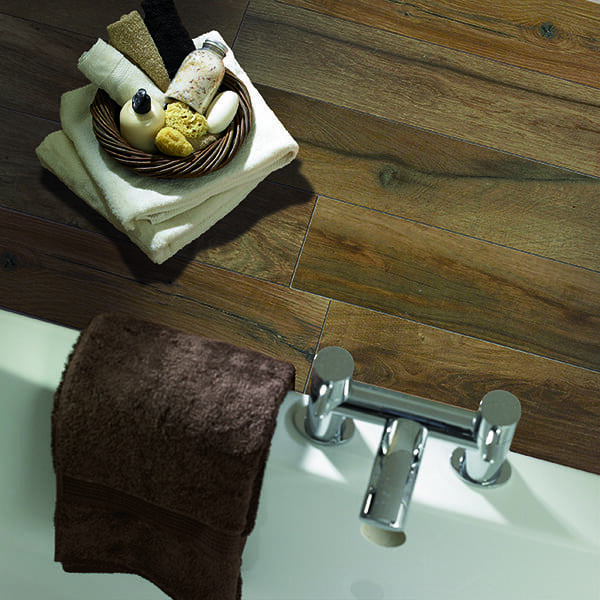 Unlike natural wood and laminate, wood plank porcelain tile isn’t easily damaged. Wood plank tiles can provide the same stylish and timeless look of a hardwood floor. While hardwood floors are luxurious, wood is not the best choice for every home. Hardwood can’t be installed in areas with high amounts of moisture such as bathrooms, kitchens, entryways, or laundry rooms. Water damages wood, but porcelain tile does not share this weakness! Tile does not absorb water so it can be installed in wet areas, including outdoors and around the pool. Wood look porcelain tile simulates natural wood, but it doesn’t stain, scratch or swell. Such porcelain tile can be installed anywhere in a home, including the basement. Perhaps the biggest advantage of utilizing wood plank porcelain tiles is the durability. Porcelain tile can last for decades without significant wear. Wood look porcelain tile doesn’t require any special cleaners or complex maintenance. Porcelain tile is produced from compressed clay dust that is heated to a high temperature. Wood planks are scanned in high resolution and printed onto the porcelain tile. The printed surface takes on the look of real wood grain and color. Due to advances in both the scanning and printing processes, wood look tile is indistinguishable from wood planks. Wood plank porcelain tiles are available in many different sizes, shapes, finishes, and wood species. Painted planks that give off the appearance of weathered hardwood are available as well. If you have any questions about this incredible flooring choice, feel free to contact us or stop by one of our showrooms. We are always happy to help!